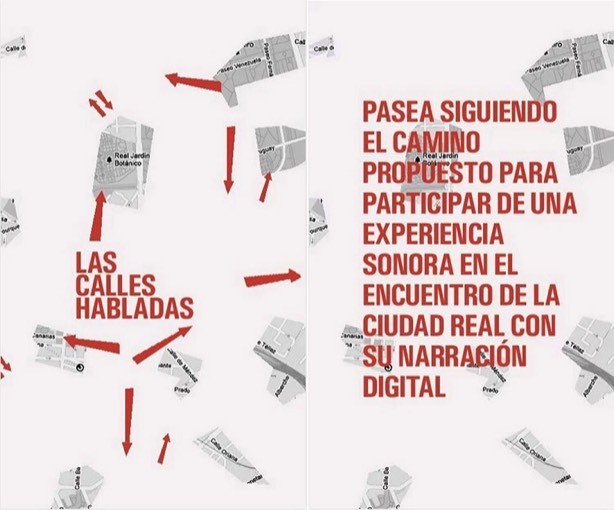 Las Calles Habladas is a Location based generative audio walk for Android. Locative sound experiment that is built in real time with the information found on the Internet in relation with the streets through which we are walking. The app proposes a map around the place where we are located and a random path. While walking on this area we listen a reading of text information published on Internet in relation with this places. This reading is created without any kind of filter so we hear text from the news, info websites, blogs, etc..together with nonsense info, symbols, code, etc.. The real city and its digital experience are collapsing in a drift that sometimes is related with the physical context and other times is totally abstract.